So, because it’s a sort of preventive product, I’d target these at the late 20-somethings, early 30-somethings. I’m not that much of a believer of using anti-aging skincare from a very early age. For me, I’d say to go with your skin and your concerns. I didn’t really actively use an anti-aging skincare regimen until my late 30’s but I believe a lot of it has to do with genetics as well. I like that the product comes in an air-less pump bottle and I don’t always say this, but I really like this pump that REN put their product in, because it’s easy to control and it dispenses the product properly without caking the cream all over the nozzle. Nothing more horrible than having a month-old product with awful caked cream around the nozzle right? Also, if you depress the pump fully, it delivers far too much product than you need. I do find that I can control how much I need quite easily, without pressing too hard on the pump. I actually use a bit more than this dollop, but I just wanted to show you the consistency of the cream. It’s fairly thick, which I will admit, put me off at the beginning. In my head, I was thinking about how badly that would fare in our hot, humid weather, and how I wasn’t too crazy about the Neal’s Yard Remedies Frankincense Cream which I found a bit too thick. 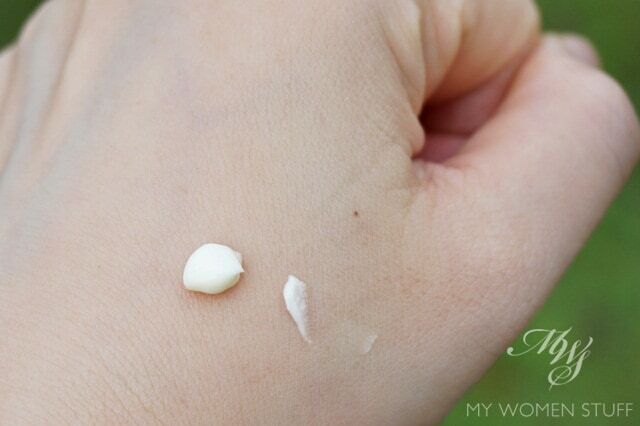 This is more so when you spread it out and apply it to your skin and see a thin white layer of cream. But don’t pan it, and don’t panic. I found that by spreading it out in my palms and applying it to my skin and spending just a few seconds massaging it in, the cream absorbs fully without feeling heavy, sticky, tacky or greasy. It actually feels light although it’s rich, which is bloody confusing! 😛 It keeps my normal-dry skin hydrated all day and doesn’t mess up my makeup. In fact, once it absorbs into the skin, it just feels comfortable. The other thing I have to note is that it has the scent of frankincense (which is where, I believe, they got the name V-cense from) so if you don’t like the scent, then you won’t like this. I like it – I find it soothing and comforting – so it gives me pleasure to use this. But it’s something I have to mention because not everyone likes that sort of earthy, musky scents. Nearly 2 months and half a bottle later, what have I noticed? Well, to be honest, nothing very much. I cannot attest to a marked reduction in fine lines (I don’t have many to start with, yes I’m very lucky I know) nor significant radiance (I use other serums and potions so I can never attribute it to just one miracle product) but I can say that my skin is holding up well and staying fairly firm and clear. I do note also a piece of news that says that REN Skincare has been bought over by Unilever (source) and you and I know what happens when big cosmetics giants get involved. Things will almost certainly change but I’m hoping REN doesn’t change too much, coz it was one of those brands where I actually liked most of their products. 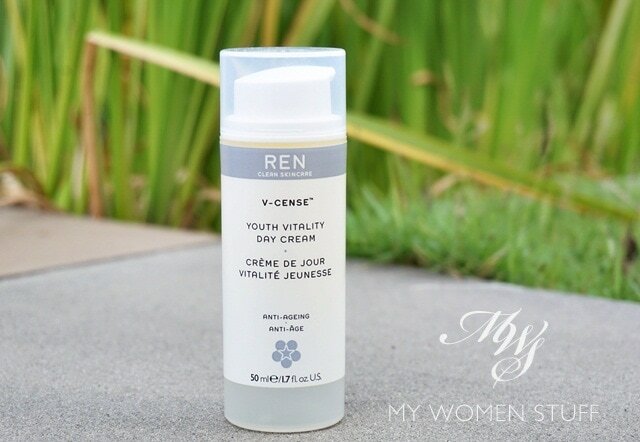 The REN V-Cense Youth Vitality Day Cream addresses signs of aging and would therefore be best targeted at those who have a problem with fine lines and skin elasticity. The texture is fairly thick and rich, but it absorbs well into the skin without leaving it feeling heavy, tacky or greasy. There is also a scent of frankincense that will dissipate but it will depend on whether you like the scent or not. I’ve gone through half the bottle without problems and I do think it’s helped with keeping my skin hydrated in the day (I’m in air-conditioning a lot) and maintaining skin elasticity. It takes a lot to get me to commit to finishing up a product, but I’ll be sad when I finish this one. Have you used this day cream? Anything from REN that you particularly like? NEXT POST: Your Say: Do you follow the mascara-wearing beauty rule or don’t you? I’ve always loved REN products, and none of them have actually disappointing me so far, & if I am to be paying that price, I’d expect it to not fail me, lol! PS: Have you tried out the REN Resurfacing AHA Concentrate? What do you think about it if you have? Hmm. I did not even know about Unilever. I love quite a few products from REN, and currently use two of their face creams. But the product that I\’ve re-purchased 3 times (!) is their omega 3 oil, love it! MY HG! I happened on the news about Unilever and I don’t think it’s been shouted about. It will be interesting to see how or if anything will change. And you’re right about their Omega 3 oil. I love it too! I used up a whole bottle a while ago, but the fishy scent sure takes getting used to haha! I enjoyed using the night cream version of this a while ago – like you say, no fireworks, just a really nice cream. The scent is gorgeous but actually too relaxing for the daytime IMO! It would be like using Kiehl’s Midnight Recovery on a morning….it would send me back under the duvet!